Last year C & A's first birthday party theme was "Floral First Birthday". I thought it was so cute to include the number in the theme so I wanted to do the same for their second birthday. I quickly skimmed Pinterest for some inspiration, but I didn't fall in love with some of the options I found. Though super cute, "Taco Twosday", "Tea for Two" and "Twotti Fruitti" didn't seem quite right. I thought about how much I loved the floral first theme. I loved that it matched the landscape where we had the party. We celebrated their first birthday in Norther California, where Ryan and I both grew up. It is so green there! There is seemingly always some flowers in bloom, and its just so lush and verdant compared to the AZ desert we live in now. A cute little garden party was so fitting. I thought since we were celebrating their second birthday in AZ, it would be a neat idea to incorporate some desert landscape in the theme. That's when I immediately thought of succulents! Of course these desert plants are everywhere and are so cute. I thought the U sound in succulent could be easily changed for two. 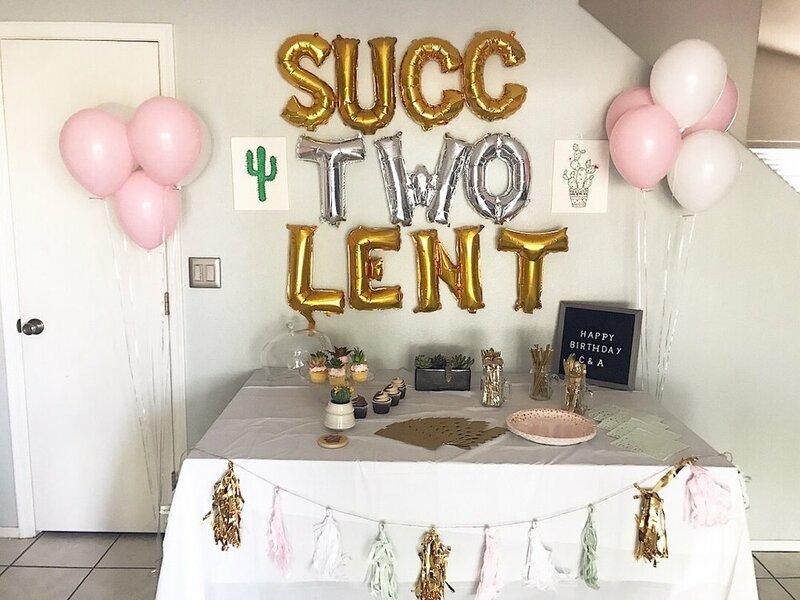 I went back to pinterest for some more inspiration only to find there have yet to be any succtwolent parties! Anyway, their party was awesome. It was a true labor of love to craft, arrange a plan a pretty party for my sweet girls. We kept the party pretty simple. The day of their birthday was 118 degrees in AZ, so we made it a small family-only party with a simple one table display. I got most of the decorations from target, keeping in mind a pastel desert scheme with a few flashes of white and gold mixed in. I got the letter balloons from party city and the regular balloons from Fry's grocery stores. I also picked up two "Minnie Mouse" balloons that I excluded from the display. My girls love Minnie Mouse and just because it doesn't fit the theme, doesn't mean it has to be excluded from their day entirely. I got the cupcakes from Fry's grocery store, and then purchased a bunch of small fake succulent plants from Michaels (70% off woohoo!). I pulled each succulent out of its planter, washed it and then just stuck it in the cupcakes. When putting up the display, Ryan thought it still didm't make perfect sense what I was going for, so we made a last minute midnight before their birthday decision to draw some succulents. We colored them using their crayons and posted them up next to the succtwolent sign--mission accomplished. As far as their actual birthday, Ryan had the morning off of work since he had a long film shoot the day before. We woke up and the girls were crazy excited about their balloons. We had a lazy morning as a family with snuggles, pancakes and opening their presents. Ryan had to leave for work around 11:30 and the girls took a nap. When they woke up, we went to a local trampoline gym and met up with a few of their friends. It wasn't a party but it was a way for them to see their friends on there big day and have some fun. I brought some cactus-shaped chocolate I had made for their friends (hopefully it didn't melt in the heat!) After the trampoline gym, we headed home for the family party. We had C & A's favorite pizza dinner and their cupcakes for dessert. C & A loved the birthday song and did a good job at blowing out their candles! One special part of their birthday is a birthday video Ryan makes every year of the highlights from their year. You can watch this year's video here, and last year's video here. It was a great birthday.